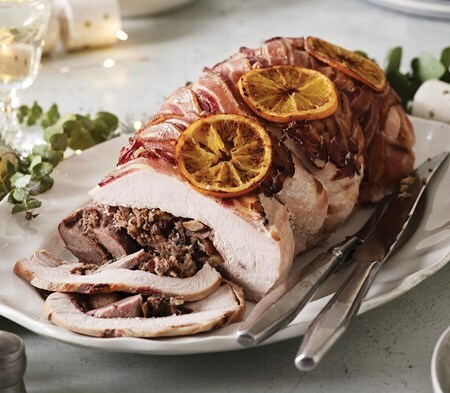 A generous English Rose turkey crown, with six duck breasts rolled inside, filled with our own sausagemeat, chestnut, orange and cranberry stuffing. *Please note: the turkey needs defrosting before cooking. It takes 48 hours to defrost in the fridge, or defrost for 12hrs at room temperature before cooking. 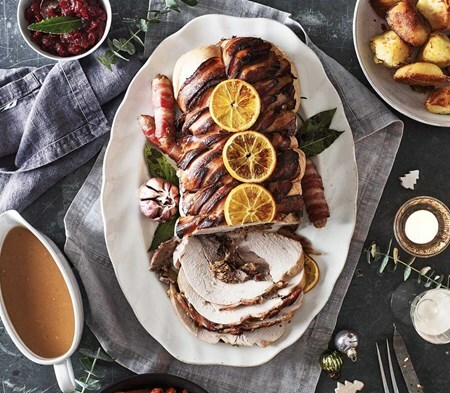 Upgrade to the Stress-Free Christmas Lunch for 12 and get this turkey plus all the trimmings – from sprouts and roasties to pigs in blankets and gravy - – for just £14.75 a head. The turkey is a slower-maturing English Rose breed which comes from William Grove Smith’s award-winning farm in Essex (who takes turkeys very seriously indeed). He follows a ‘plough-to-plate’ philosophy, growing all his own wheat and barley to feed the birds, using his farm straw for their daily bedding and recycling their waste as fertilizer for his fields. Our duck is from Silver Hill Farm in Ireland, one of the most respected, higher-welfare duck suppliers in Europe. As well as providing excellent duck – their particular breed is a closely guarded secret – they are serious about sustainability and are a farm with zero carbon footprint. To create what is surely one of the seven wonders of the food world, our chefs start by making a delicious festive stuffing. Onions are sweated in butter, then in goes orange liqueur, chopped sage and orange zest. This is then mixed through sausage meat, chopped chestnuts, sweet-cure bacon lardons and dried cranberries. Next, the turkey: a generous crown is seasoned with salt and pepper, then filled with six whole, skinless duck breasts and a good amount of the stuffing. 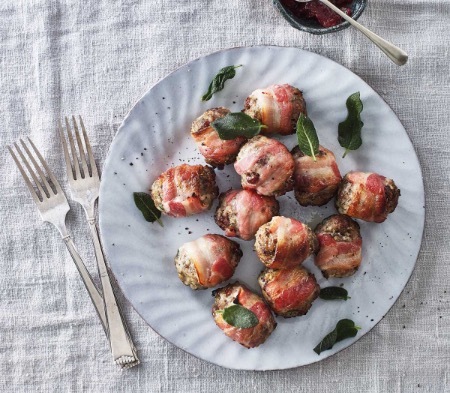 The crowns are rolled up, wrapped with treacle and beer-cured bacon and garnished with orange slices. Turkey (62%), Duck (16%), Stuffing (13%) (contains: Sausagemeat (contains: Pork Cuts (Pork Shoulder, Pork Belly), Water, Gluten Free Rusk (Dehydrated Potato, Rice Flour, Salt, Dextrose), Salt, Potato Starch, Spices (Nutmeg, Black Pepper, White Pepper), Herbs (Sage), Sugar, Citrus Fibre), Onions, Chestnuts, Sweetcure Bacon (contains: Pork, Salt, Dextrose, Vinegar, Preservatives (Sodium Nitrite, Potassium Nitrate), Antioxidant (Sodium Ascorbate), Smoke), Sweetened Dried Cranberries (contain: Sugar, Sunflower Oil), Orange Liqueur (contains: Alcohol, Water, Sugar, Orange Flavouring (Natural)), Orange Peel, Butter [Milk], Roast Duck Stock (contains: Concentrated Broth from Duck (Duck Skin, Water and Duck Fat), Maltodextrin, Glucose, Salt, Yeast Extract, Onion Powder, Sugar, Thickener: Xanthan Gum, Emulsifier: Diglycerides of Fatty Acids and Herb Extract (Rosemary)), Sage, Free Range Pasteurised Whole Egg, Salt, White Pepper), Beer and Treacle Streaky Bacon (contains: Water, Salt, Dextrose, Sodium Ascorbate, Sodium Nitrite, Old King Cole Porter (contains: Malted Barley, Crystal Malt, Brown Malt, Black Malt, Hops, Water, Yeast), Tate and Lyle Black Treacle), Orange Slices. Remove from packaging, place in dish and cover. Defrost for at least 48 hours in the fridge or 12 hours at room temperature. Ensure it is fully defrosted before cooking. Once defrosted, keep your turkey in the fridge. Preheat oven. Place in a roasting tin, cover with foil and cook in middle of oven for 120 mins. Remove the foil and continue to cook for further 10 mins to allow the bacon to crisp. Before removing from the oven, use a fork or skewer to pierce the centre of the meat, the juices need to run clear with no hint of redness. Ensure piping hot and allow to rest for 30 mins before carving. These cooking instructions are only a guide. Your oven may have a personality of its own (or a different power setting), adjust accordingly. Please be aware that the bacon causes the turkey to turn pink, this is normal and does not mean that the turkey is not cooked. Although every care has been taken to remove all bones, some may remain.